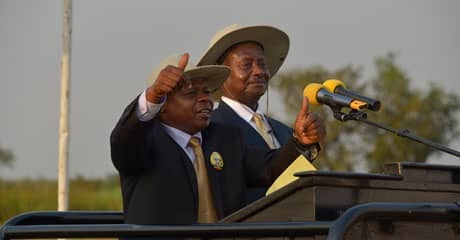 KAMPALA – President Yoweri Museveni has in a reshuffle announced Friday June 15, afternoon moved several Resident District Commissioners (RDCs) and deputies to various districts. In the reshuffle several old timers have been dropped and newer faces surfaced. Key among the transfers is the vocal Fred Bamwine who started his career as RDC in Nakawa, Kampala where he was deputy RDC for the division, later transferring to Butambala and Buikwe districts and has in the latest movements come closer to the centre, becoming RDC Mukono. In other changes, the president has named Mr Dusman Okee, a brother to opposition DP President General Nobert Mao, as RDC for Padre. Mr Museveni also brought back scandal ridden Dan Kaguta, a man with relations to the first family and new RDC for Rukungiri. The NRM was in the recent District Woman MP by-election flatly defeated by the FDC despite a huge investment of cash goodies in the district by the President. Dan Kaguta was until last year facing a corruption trial by the IGG at the Anti-corruption court. Former Kooki legislator Maj. Rtd David Matovu has been appointed RDC of the newly created Kyotera district. In the new twist, Lyantonde RDC Tiguragara Matojo, who has been dropped and Deborah Mbabazi who has been moved from Kampala to Bugiri. Major Martha Asiimwe has been moved to the newly created RDC secretariat that also has James Tweheyo and Sr Mary Grace Akiror. Meanwhile the President has come true to his recent pronouncement, officially naming former Uganda National Teachers Union -UNATU General Secretary James Tweheyo as head of the new anti-corruption unit attached to State House. Mr Museveni, while announcing the unit during the State of the Nation address at Serena Conference Centre in Capital Kampala, said the parallel team to the IGG office will address the rampant corruption scandals in the country. The anti –corruption unit also has on it Ms Martha Asiimwe and Sr.